Julian Cope is dead to me. He died at Christmas 2013 when he pulled out of a concert at the Black Box in Belfast, citing “the current security situation there and the logistics involved”. What this amounted to was a couple of dissident republican issues around town. A few squibs by Belfast standards. We had been at a gig in the Cathedral Quarter on December 13 when a suspect device was found at the side of St Anne’s. SOAK had continued with her performance two hundred yards away and we stayed at the venue with the young fans until their parents could collect them. No fuss, nobody got hurt and songs with meaning were shared. But this was enough for Cope to nix his January 16 booking at the Out To Lunch Festival. It was especially depressing because Julian had presented himself to the world as a libertarian, unfettered by convention, lashed on drugs and the proponent of foolhardy japes like “sock”, when he would crawl over the roof of a moving vehicle with a sock over his head. He had witnessed the Poll Tax Riots of 1990 and had written keenly about it for the NME. Now here he was, backing out of a local gig on a minor pretext. We had thought all that was behind us. The Seventies were mostly wretched here. Bloody Friday, The Miami Showband Killings, The Shankill Butchers, The Abercorn Bombing – pick your own savage moment. Big touring acts avoided Northern Ireland for the most part. We had reliable friends like Rory Gallagher and then by degrees, the punk and metal bands engineered a way beyond the deadlock. Belfast was demonstrably a rock and roll city again. Which is why Julian Cope made such a poor call in 2013. “When we were growing up in Belfast, I was always saddened by the fact that groups would never come and play there because of the political situation. I was deprived of another “normal” part of life. With this in mind, and with the wonderful co-operation of our Parisian promoter, the S.L.F. show at Backstage at the Mill, WILL GO AHEAD AS ADVERTISED tomorrow (Tuesday) night. They would never have wanted this kind of profile, but SLF have delivered on their songs and their sentiments, true to the now-ancient punk rock promise. I hope that tonight they will play ‘Wasted Life’ a song that instructs their listeners to reject the paramilitary call. 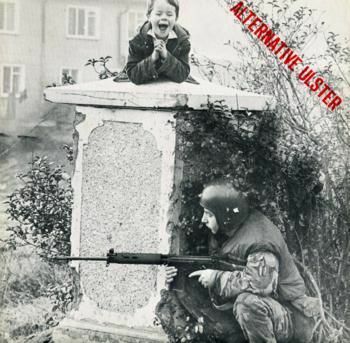 At a time when militaristic anthems are billowing across the western media, I’m sure that they will sign off with ‘Alternative Ulster’ one of the greatest inverted anthems – a righteous shout-out to youth, instructions to climb out of the sectarian trenches and to be the self-appointed agents of change. All of this with roaring guitars and a voice that is still engrained with hurt and disgust. Dictators, fundamentalists and killjoys hate popular music. Hitler and Goebbels tried to exterminate jazz, billing it as “entartete” (degenerate). The Eastern bloc was like-minded and significantly, the Velvet Revolution in Czechoslovakia was part-inspired by Lou Reed’s miscreant tones. The best rock and roll is sensual, dangerous and free. Perhaps that explains Ballymena Council’s determination to ban an ELO concert in 1993, citing the perils of “Drink, Drugs, Devil and Debauchery”. Likely, they were just ignorant. Certainly that’s why ISIS have been burning drums and saxophones in Lybia and why the Bataclan murders were a conscious assault on music, art and expression. “This is the first direct hit on music that we’ve had in this so-called War on Terror or whatever it’s called,” Bono told Dave Fanning on Saturday. He knows there are precedents of course and there will be a unique resonance when U2 reaches Ireland this week and performs the ‘Sunday Bloody Sunday’ / ‘Raised By Wolves’ segue – Derry, Monaghan, Talbot Street, Croke Park, all conjoined in the tombstone blues. But bless SLF. A band that signposted the way to U2 and ‘War’. Protest merchants from Belfast arriving at a moment of pure relevance. Bold, obstinate, ever-inflammable.